Exploring its many ancient rock art sites is one of the great joys of touring Australia. Carnarvon National Park rock art. One of the great delights of travelling in Australia is that you never run out of adventures. A single encounter can turn into a passion, as Aboriginal rock art did for us when we first saw Ubirr Rock in Kakadu over 40 years ago. Many rock art adventures later, we know we could spend the rest of our lives seeking more out, yet still only scratch the surface of what there is to see. It would be a great shame to tour Australia and miss the rock art that is more easily seen. Always check each state’s national park’s website and look through the cultural section for possible rock art sites and/or tours. While the artwork itself becomes more complex the further north you travel, Victoria has sites in and around the Grampians. Off C221 from Stawell to Pomonal is Bunjils Cave, with a nice tableau tucked into a rocky outcrop that is accessed via a scenic walk from the parking lot. Near the Stapylton Campground within the Grampians are the Ngamadjidj and Gulgurn Manja Shelters, well worth a visit if you are doing the superb Hollow Mountain hike. For those who have set-up in the central area of the Grampians, a 4WD trip to the western end of the park should include the Manja Shelter, with its panel of hand stencils left by the Jardwadjali people. About 3km north is the Buandik Campground and a walking track to Billimina Shelter with more rock art. Guided tours may be available from Brambuck the National Park and Cultural Centre. Everyone loves the Flinders Ranges, and on the way up from Port Augusta, it is worth having a look at Yourambulla Caves, with access off B83 about 56km north of Quorn. This historic reserve may or may not be open, so ring the Hawker Information Centre first to check. In the national park itself, a drive to Sacred Canyon with a walk up the creek bed will reveal (to those who look for it) some examples of rock carvings. New South Wales has its share of rock art too. In Sydney’s Ku-ring-gai Chase National Park, there is an art shelter near West Head. Along Resolute Track is the Red Hands Cave, and on The Basin Track is a rock-carving site along a wooden walkway. North Narrabeen has ferry access to Ku-ring-gai Chase. While these are all worth seeing when you are in the area, some sites are destinations on their own. The Carnarvon Gorge section of Carnarvon National Park, Qld, offers the superb Art Gallery with a 62m long mural of about 2000 stencils, paintings and engravings. Further up Carnarvon Creek is Cathedral Cave with rock engravings and more art work; it is easy to see why this must have been such an important gathering place. 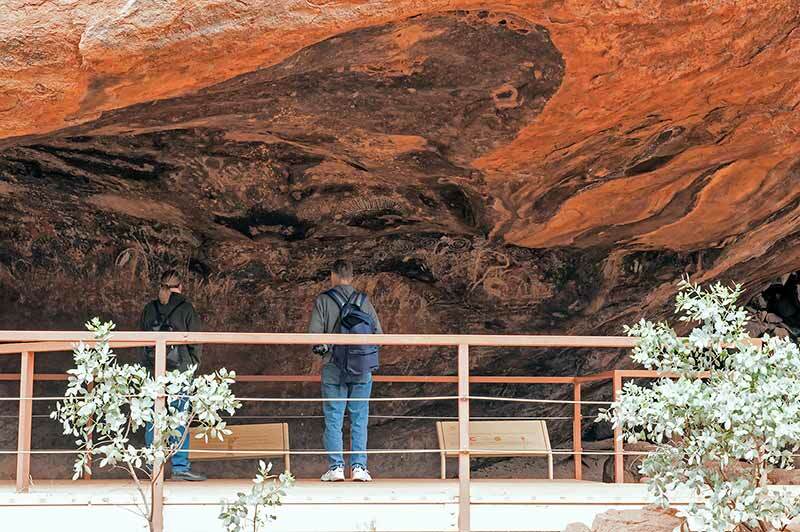 Be sure to take advantage of the park ranger interpretive talks on the rich Aboriginal culture and art in the park, and don’t miss the short walk to Baloon Cave near the Carnarvon Creek Wilderness Lodge that offers a painting so perfect it is like a canvas hanging on a wall. Caravan camping is available at the Takarakka Bush Resort or self-sufficient campers can stay at Sandstone Park. Check the national park website for more information. Ancient rock art in Mount Moffat. The Mount Moffat section of Carnarvon National Park is a bit harder to access via 124km of unsealed road: this area is best suited to 4WDs and offroad vans. The Dargonelly Rock Hole and West Branch campgrounds have sites for vans and from these the rock art enthusiast must not miss The Tombs, which has an astonishing full body stencil, and Kookaburra Cave, which has a lovely panel of art. Archeological digs at Kenniff Cave revealed that the Bidjara and Nuri people have lived in this area stretching back as far as 19,500 years. And so with these minuscule examples of what there is to see, let’s continue north in Queensland to Quinkan country in Cape York. About 48km north-west of Lakeland on the road to Laura is the Split Rock Aboriginal Art Site with a walking track that leads to three galleries. These can be done on your own, but even better is a tour from the Quinkan & Regional Cultural Centre in Laura that offers a wealth of fascinating information and interpretation. This can be done as a day trip from Lakeland or even Cooktown. For a full immersion into Quinkan Country, a 4WD trip to the Jowalbinna Rock Art Safari Camp is an adventure you’ll never forget. The 40km Maytown track branching just past Laura will deliver you to the Jowalbinna campground (which also offers accommodation). Leave the caravan in Lakeland or Cooktown; only high clearance offroad camper trailers will make it through. There is basic BYO accommodation and the rock art is superb, accessed with the Trezise Bush Guides. Cooktown also has rock art; this is best seen with the traditional elder, Willie Gordon, who offers the outstanding Guurrbi Tours complete with the stories behind the rock art of the Nugal-warra people in the Wangaar-Wuri region. Again, these examples are only a few grains of sand in a landscape of tens of thousands of sandstone sites. In Alice Springs, with a base at one of the caravan parks, a 4WD trip along Old South Road takes in a very bumpy 35km to the Ewaninga Rock Carvings Conservation Reserve. The origin and meaning of the petroglyphs is either unknown or sacred-secret, and the site is in the custody of the Arrernte people. It is most worthy of a visit, and it is certainly worth noting that you drive right under a section of the Overland Telegraph Line and over a section of the Old Ghan Railway as you turn off for the parking area. Also, in the Centre, Uluru offers rock art in addition to that stunning scenery. The ranger-guided Mala walk is most worthwhile, and a self-guided walk around the entire rock offers a number of Anangu art sites with excellent interpretive signs. The Northern Territory can lay claim to much of Australia’s most magnificent rock art, and Kakadu offers easy access to a tiny few of the galaxy of sites. Ubirr Rock is amazing, with three main sites including a rock surface high above a walking path with a painting of a thylacine. Free ranger guided rock art talks are presented daily and should not be missed; the Ayal Aboriginal Tour with Victor Cooper (a Minitja man) includes Ubirr Rock. At Nourlangie, the Anbangbang Gallery has artwork that was repainted by Aboriginal elder Nayambolmi during the 1960s. Archeological evidence indicates that the sites were used as far as 20,000 to 60,000 years back. The Nanguluwur art site via Gubara Road should not be missed, either, though the 3.4km (return) walk in the hot sun can be fairly draining. Rock art in Nanguluwur, Kakadu. The rock art adventure of a lifetime has to be at Mount Borradaile with Davidson’s Arnhemland Safaris. The cost is as breathtaking as the art galleries, but long after the credit card is paid off, the wonderful memory will remain. The art sites here are astonishing, and the guides will have you reeling with all the information they share. Experienced four-wheel-drivers up for a challenging track can leave the van at the Aurora Kakadu Caravan Park in Jabiru and drive up via Cahills Crossing, or you can fly in on the Davidson plane from Jabiru or Darwin. If the Kakadu/Arnhemland’s rock art is superb, the Kimberley’s rock art is sublime. Here, the two distinct styles of the Wandjinas and the Gwion Gwion (or Bradshaws) can be seen side by side. The Kimberley stations all have sites, but access to these is severely limited by the terrain and the fact they are on private property. If you are attempting the mighty Gibb River Road, then visit El Questro with an easily found panel of art at the end of Chamberlain Gorge that is accessed on a boat tour or by boat hire. Gwion Gwion panel on Mitchell Plateau. Anyone who can make it up to the Mitchell Plateau should do so, and it would be criminal to go all that way and not see the art sites. One hundred and one kilometres from Drysdale River Station is the turn-off to Mitchell River National Park; 6km further is the King Edward River crossing immediately followed by a track on the left. Take this to a car park and walking trail to some fine examples of Wandjina rock art. The Munurru Campground is next, and 5km further is a rough track on the right leading to a car park and walking track that has both Wandjinas and Gwion Gwion panels. A thorough search here will reveal some amazing art. Up on the plateau itself, the walk to Mitchell Falls includes more art sites. Back along the Gibb River Road, Mount Elizabeth Station has some stunning panels of rock art in equally stunning locations like Wunnamurra Gorge. From the Mount Barnett Campground, the walking track from Lower Manning Gorge to Upper Manning Gorge includes Aboriginal rock art along the way. Galvans Gorge has some Wandjinas staring down from the surrounding rock ledges like ancestral ghosts. A trail through Deep Gorge reveals one of the largest collections of petroglyphs in the world. Leaving behind rock art heaven, another stop along the way is Karratha. From a regional caravan park, do not miss the chance to take a drive up the Burrup Peninsula to Deep Gorge where a 3km walking trail through scorching beauty reveals the largest collection of petroglyphs in Australia (and possibly the world). Over 10,000 etchings carved into massive red blocks scattered like the toys of a mythological being make this a “must see, must do” rock art adventure. So there you have it: a tiny sample of the rock art adventures that are out there… and yet more reasons to keep touring Australia.